The following piece was first written for Lionheart magazine just after London Fashion Week. It always feels important to explore and unpick the whole experience, rather than just report on the shows. Some of the aspects mentioned here have already appeared in other guises in previous posts. Thank you to the talented photographers whose photos appear here. Their skill is appreciated, as always. London Fashion Week is a bubble of watching and being watched. We watch the shows and presentations; observe the bright tangle of people outside Somerset House; perhaps spend some time staring at whoever is gracing the front row. That celebrity or editor who occupies the foremost bench inhabits both sides of the mirror – observing the models who stride past, and being observed by others in the showspace. They are both the watchers and the watched. Perhaps unsurprising. Fashion is primarily a visual industry – with success, at its most basic level, dictated by how good something looks (or is perceived to be). That doesn’t necessitate that designs must be beautiful or pretty, but that whatever shape the garment takes, it works if it pleases, inspires or provokes the watcher. Seeing is the most important of the five senses at London Fashion Week. Of course the beat of music and river-current-hum of conversation have their place, as does the hard flutter of the camera shutter. But the main medium here is fabric – the cut, the shape, the pattern, the texture, the colour. These elements come together to create a cohesive whole. The concept of that cohesion, along with watching and being watched was firmly underlined at Corrie Nielsen’s show entitled ‘Enigme Absolue’ which took place in a gallery near Covent Garden. With large glass windows on both sides of the square room, there was a sense of being enclosed and cut off mixed with seeing life surging beyond the walls. Passersby peered through the glass, curious on catching sight of the flagged flooring, the violinist and cellist in black, the headless mannequins on display, the glorious clothes on the models. The show was a deliciously dark spectacle to those of us watching from the inside, and quite a different sort to those outside. We as the watchers were part of the mise-en-scene to those looking in. But our eyes were firmly fixed on the clothes – a selection of designs in black, navy and plum. There were recognizable design patterns in the drapery, the oversized shoulders, the large fabric ‘knots’. But this season’s offering from Corrie Nielsen was the antithesis of her previous collection. The early dawn of Florilegium had been replaced with a gradation of shades from blue twilight leading through to black midnight. It was the equivalent of a pared back Gothic novella – short, well structured, full of resonance and beauty, ending with a truly glittering twist. Tailored jackets, stiff, ornate coats and skirts shaped like black seedpods gave way to a model clad in a fluid creation of silver sequins and duchesse satin. The fabric of the headdress fell to the small of the back, and then out into a train that slid behind the woman as she walked toward the cameras. The Lady of the Lake had been cast onto the tiles of this London-bound gallery and I watched, enthralled. I relish those designers who value not only the narratives driving their design process, but the aesthetic impact of the finished products. Orla Kiely was similarly memorable in her presentation – a retro typing pool complete with typewriters, desk lamps, filing cabinets and models with beehives, all clad in a desirable range of fifties and sixties influenced clothes. The atmosphere may have been at the other end of the spectrum to Nielsen’s, but both produced visual feasts. Outside the presentations and shows, watching and being watched are activities that find their home on cobbles and pavements. Street style photography is partly the art of watching; subjects becoming the watched as they are noticed, approached and focused on through the frame of a lens. The most talented street style photographers tend to be those who are observant – not only to what those around them are wearing, but to the way the light is falling, to nearby locations, to the potential composition of shots. Therein lies the skill. Some set up photos carefully away from the crowd, others capture what goes past in a rattle of clicks. Their particular glimpse or perspective is shared with others. For there is an additional layer – the internet. Being at LFW enables watching of both people and shows, but both the catwalk designs and the street style shots are then showcased on a profusion of websites around the world. Clothes are subsequently viewed through screens and it is impossible to count how many individuals have seen them. The observation continues. 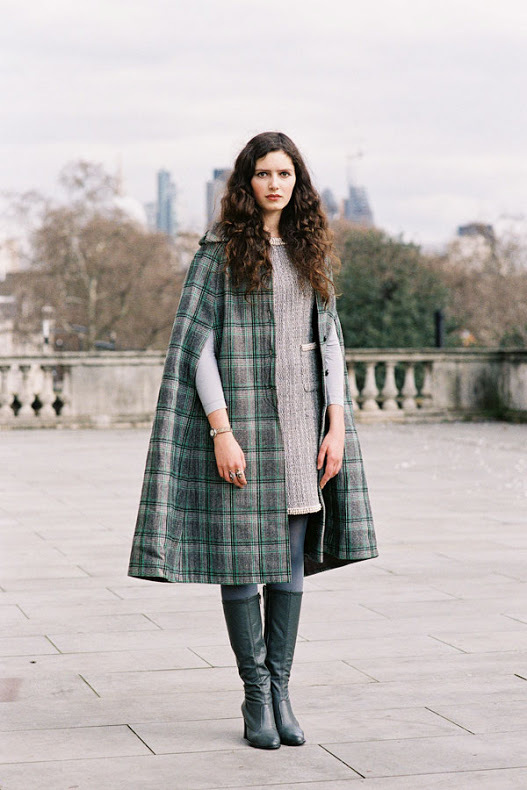 What great finds both the gorgeous cape and boots were. 'Fairy god-mother' certainly seems like an apt name for someone who gives you that absolutely delectable Chanel dress! You look stunning and the shots are great, lovely to see your picture in Vogue too. Your description of London Fashion Week and the shows are beautifully written. Especially how you described the Corrie Nielson show. I love street style photography, and I always enjoy visiting my favourite street style blogs during LFW (especially Dvora's blog.) And it's always wonderful to see what you wear and what you write about London Fashion Week and street style. Once again your writing is beautiful! I'm not usually one to read long posts but I always read yours. You remind me of Little Red Riding Hood all grown up, perhaps you killed the wolf with your bare hands or even started dating him. 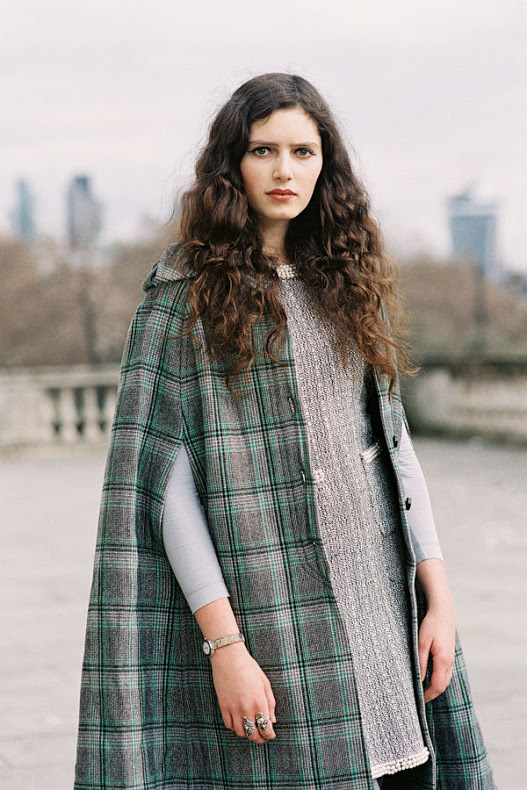 I love this sophisticated cape dress with the vintage Chanel. 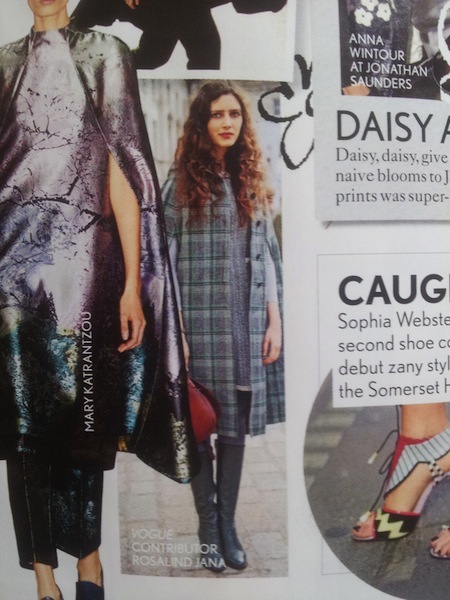 Your sensitivity to the electricity in the air at LFW is what makes me enjoy your piece so much. Watching and being watched... The play between drama as dreamland and drama for sale in pieces we can wear... so much imagination at this event. I rely on you and your brilliant photographers to record such things. Very unique style - the coat looks perfect! I so enjoyed reading your lovely piece about scent in Vogue, and spotted you resplendent in that gorgeous cloak on the Vogue 'People' page, ahh the kudos! Fascinating to read your response to LFW detailed here dear Roz, it sounds like a strange but often inspiring event once one gets used to being part of the mise en scene. I love your outfit, the drama of that cloak and that incredible vintage Chanel. One of the most dangerous aspects of fashion since it was born is that it can easily be mistaken by superficial. In my mind it's never that and I constantly try to give fashion the place it deserves. Whenever I see an inspiring dress my head is filled with time periods, movies, culture and stories, above all stories. This is the vision of Alber Elbaz and this is what this post made me feel, your description of a fashion show is beyond transporting, you always make justice to fashion. Visual reflections of our dreams are indeed the most valuable of our gifts when an aesthetic experience with fashion is the case. Thank you for writing this. I really love that look and the dress is amazing! I do love your cape. I'm such a sucker for a cape ... but then, they were so much a part of the '70s. A beautiful subtle ensemble. Ah, Roz, the way you write. This is such a luxury - catching up on some of your posts - and what compelled me to comment here was that line, 'there is another layer.' Because you're such a quintessentially English rose - like from another time - it reminded me of that line that makes me cry every time 'for there is another country I heard of long ago.' Which I recently read was written, not by an Englishman, but an American - and he was talking not about England, but heaven. Which is one and the same thing. I saw you in Vogue - which I don't even read these days, but Kevin brought it home (his friend publishes Glamour and gave him a copy). And then I remembered I've got shots of you at LFW, on the last day! Tomorrow I'll do a post, just one shot, of you, and link it to this post. Where you say it all better than I do. I love that you showed you, in the same clothes, shot by Dvora and Vanessa. Both are beautiful portraits. But while Vanessa's is beautiful in a more obvious way, I love the humour of how Dvora styled you in a symmetric position next to those 'ugly' signs. That's not an accident, that's a choice. I saw Dvora recently. She's a lovely human being, in every way.